I love a good adaptation of a family favorite recipe. It’s even better if the adaptation includes some grilling! 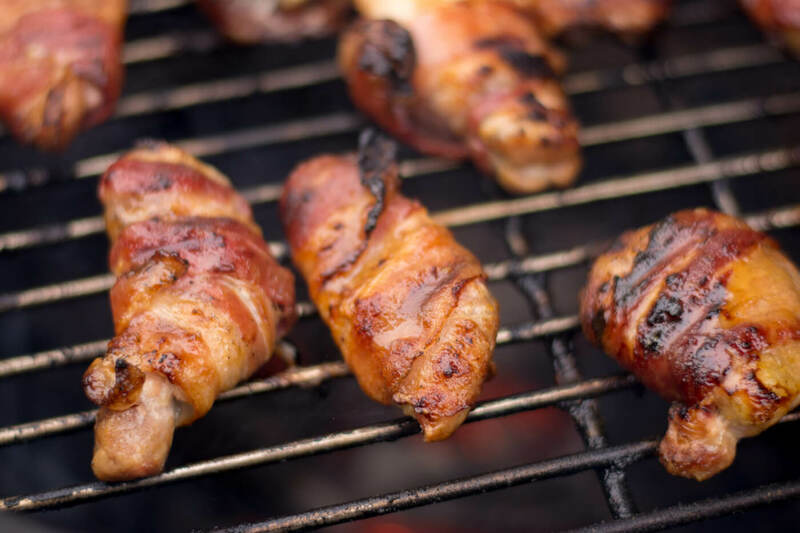 These Honey Mustard Glazed Bacon Wrapped Chicken Bites are one of those recipes that comes out fabulous every time I make it! This meal has been a family favorite for years. A couple of years ago, we moved this recipe to the grill and the taste got even better than it was before. What is honey mustard? How to make honey mustard? I’m not being sassy, I promise. But, honey mustard is the really just the combination of honey and mustard. It might taste much more complex than that, but just try it. Seriously. I have seen recipes for honey mustard that mix in vinegar, salt, pepper, and mayonnaise. But I really can’t tell a significant difference. Feel free to add in those extra ingredients to modify your sauce. I found that I just liked plain old simple honey plus mustard. Have fun with the ingredient. Try out different types of mustards, too. There are spicier mustards that can add a “kick” to your sauce rather than using the plain, yellow mustard. Our family loves a good dijon to make it. But really, play with this and make it your own. 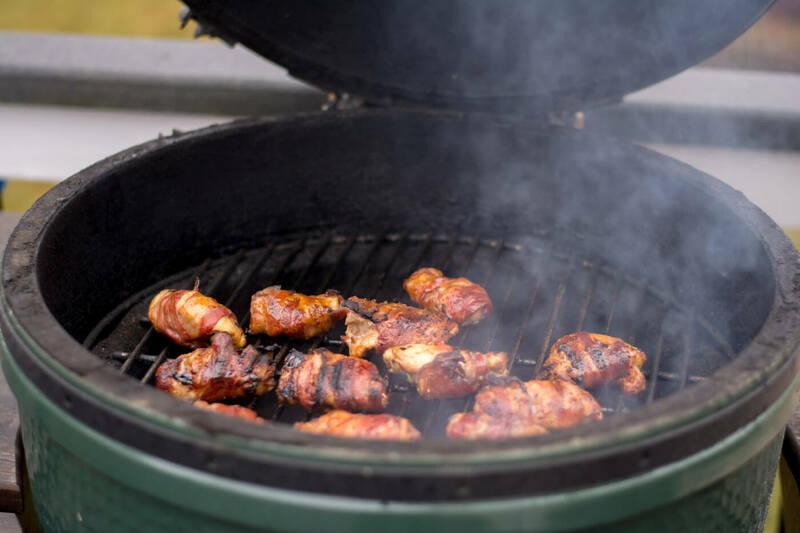 How do you cook honey mustard glazed bacon wrapped chicken on the Big Green Egg? Set up your grill for direct heat. Keep the temperature around 350, though. The direct heat will sear the bacon and won’t be too hot to burn it before the chicken is fully cooked. Expect that the bacon grease will drip into the coals and create some smoke, though. What kind of chicken to use? We use a lot of chicken thighs or tenders in our house. 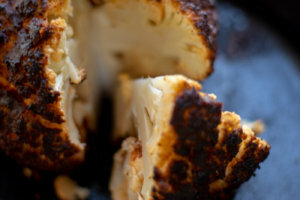 They are easy to prepare and full of natural flavor. I found chicken breasts work just as well for this. 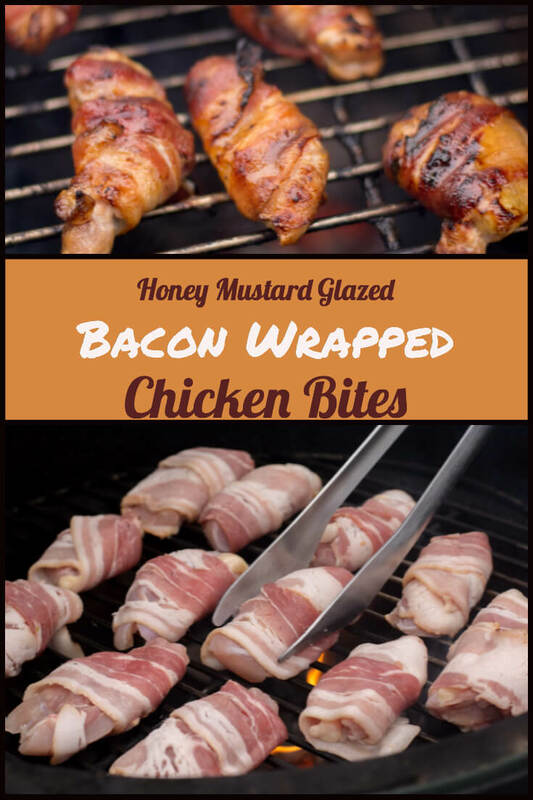 If you choose to wrap bacon around chicken tenders (and I have no idea why you WOULDN’T!!! 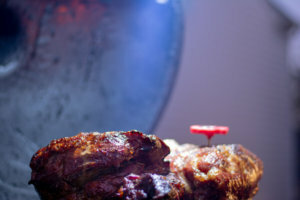 ), double check your internal temperature before removing them from the grill. 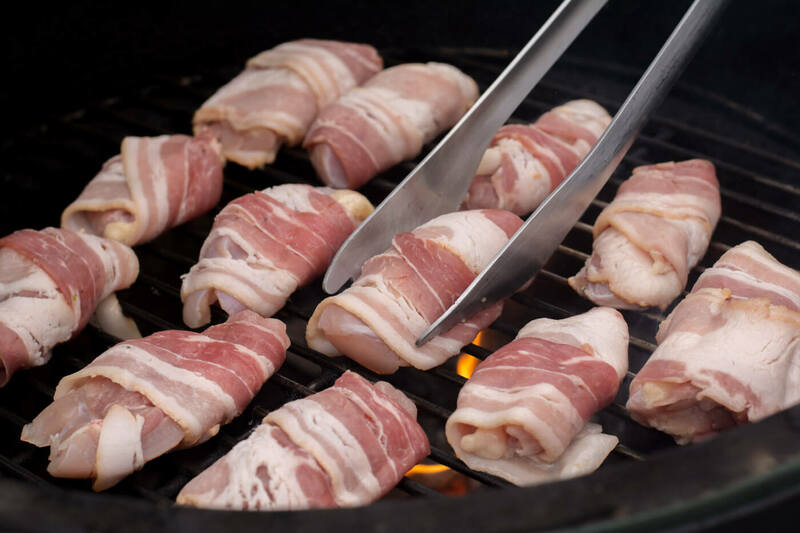 Sometimes, the bacon wrap adds a few minutes to the grill time. What kind of bacon to use? It is easiest to use thinly sliced bacon for this recipe. You will get the full flavor without the cthe challenges of dealing with the thicker slices. 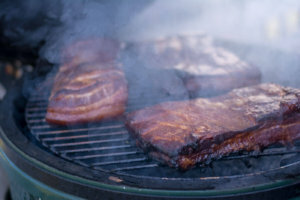 I highly recommend you check out this recipe on curing and smoking bacon at home on the Big Green Egg. The first thing you will want to do is to combine the ingredients to make your honey mustard. Combine the ingredients and whisk, nothing else needs to be done here. Can it be any easier? Set up your grill with direct heat. For the Big Green Egg, take off the plate setter and light the coals to bring the BGE to 350 degrees. It’s as easy as that. Cut the chicken into 1-2 inch chunks and slice each piece of bacon in half. 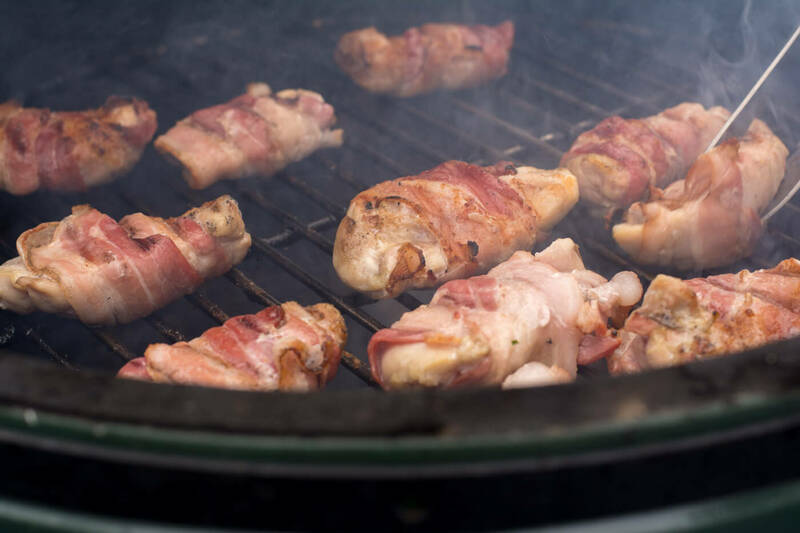 Wrap the half piece of bacon around the chicken and place it on the grill. 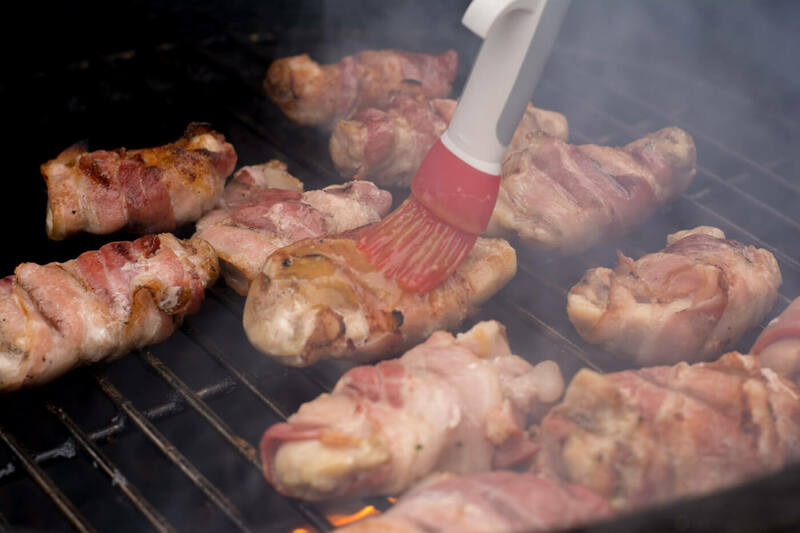 After about 6-7 minutes, turn the bacon wrapped chicken over and slather it with the honey mustard sauce. Let it cook for another 6-7 minutes until the chicken is cooked through. I reserve some of the sauce for adding to the meat when it is time to serve. For such a quick cook, this is an amazingly delicious meal to serve! Mix honey, mustard and lemon juice from one lemon into a bowl and whisk. Set aside 1/2 of the honey mustard sauce. One is to brush on immediately and one is to brush on at the end. Cut bacon in half and wrap around each 1 inch cube. Brush on honey mustard mix with half the marinade. Place on grill with direct heat at 350 degrees and cook for about 6-7 minutes. Brush on remaining honey mustard sauce and cook for 6-7 additional minutes.